Delicate & feminine this Swarovski AB Crystals & Swarovski White Pearls Drop Necklace Crystals dazzle with the beautiful AB Crystals Drop.Our Bridal Handcrafted Custom Jewelry are made with Swarovski Collection & latest style & upcoming designs. 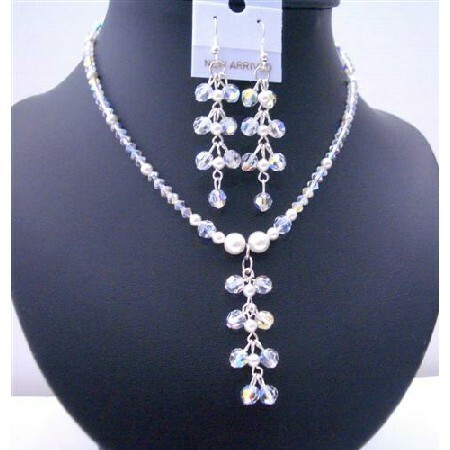 This is very beautiful delicate sleek & elegant Necklace Set made with Swarovski AB Crystals with Swarovski White Pearls & Sterlig silver Earrings. Sparkling Crystals features gorgeous with Swarovski Crystals. Each has been hand-matched & hand strung; the Necklace & earrings is The ultimate layering piece or bold & beautiful on its own you must-have thisMake your dream comes true it is your special day Let us pamper you by creating the most lovely & perfect bridal jewelry just for you & your bridal party.